Careentan.com: The White Atelier Journey- How It All Began. The White Atelier Journey- How It All Began. It's probably one of the longest periods of absence from blogging, and trust me, I've been missing real badly the act of typing on this very keyboard, and just letting my thoughts flow through to you. I'm truly sorry for the absence. Must be pretty sucky to come back every now and then only to be greeted by the same posts looking back at you! I understand cos I visit my own blog sometimes too and the thought of not having time to update sucked the life outta me. Which was why I tried my very best to still update as frequently as I could on Instagram (and now, Instagram Stories!). And reason for my absence? Some of you who have been following this blog would know that I've been talking about this new venture that I was keeping my hands busy with, but revealed nothing further than that. And for the rest of you who follow me on other platforms (especially Instagram) would know the reason for my absence. Before I reveal more, let me take you back to the very start- how it all started. Somehow I didn't end up pursuing this and went for Communications instead, which was highly encouraged by Boon cos he thought it suited me better. The more I explored Mass Communications, the more I felt yeah I probably suit this industry more. All throughout my university years I only had one goal- that was to graduate and start making money. My course was more theory-based than anything, and I couldn't wait to get out there and start earning real life working experiences. During my last year of uni, I started an online boutique called Chiq Fliq out of interest, so that was what I continued working on after I graduated, alongside hosting, blogging, a little bit of freelance PR and so on. It wasn't until I started planning my wedding 6 years ago that I was exposed to the wedding industry. It was something really new to me cos at 22, most of my peers were still in uni while I was preparing for my wedding, so it wasn't something that I had thought much about. Aside from some friends in church who were years my senior, nobody else around me were talking much about weddings. Unlike today when we have so many ppl discussing about weddings on social media everywhere, during my time (omg I sound old already hahaha) 6 years ago, we only had Pinterest and some wedding forums that bridezillas congregate to rant incessantly. Even then Pinterest wasn't so full of inspirations unlike the Pinterest today. But I had ideas of how wedding prep would be like...from the movies. I envisioned that wedding prep would be fun and exciting, and all my wedding vendors would be as excited as me about our big day. One of the most exciting parts of wedding planning to me was finding the perfect gown. It was one of my top priorities for our wedding, along with engaging a really good wedding photographer. Photos from our wedding were going to be memories that last a lifetime, and my wedding gown was going to be something I'd wear to walk down the aisle to my soon-to-be husband and the very gown I'll say "Yes" in, so it had to be something I really liked, something that interpreted my style and character, something that was perfect. Days leading up to the grand search I imagined that as a bride-to-be, I would be greeted by enthusiatic bridal boutique assistants who would devote their time and attention to focus on the needs and requests of this excited bride-to-be. I imagined that it would be a magical experience when I tried on my first ever wedding gown. I imagined that I would be so spoilt for choice by the hundreds and hundreds gowns available at the showroom. By now you can probably tell that I was living in a fantasy, and I was very naive. My wedding gown search started in THE bridal neighbourhood, where almost every bride would begin their search for the perfect gown. I mean, why wouldn't it be? At that time, there were at least 15 bridal galleries in the area. There must be ONE gown that I could find right? Since we decided that we were going to prioritize photography, we engaged a close friend of ours, Vincent to shoot our pre-wedding and actual day photos, cos we really liked his style. And since we already had our preferred photographer, we were not looking for photography packages, and was just looking at renting a wedding gown and an evening gown. But that didn't please the people at the bridal galleries very much. Usually upon reaching the bridal boutiques, we would be greeted by their nonchalant, uninterested staff. When we rang the doorbell, before even welcoming us into the shop, the staff would ask us, "Yes?" with an annoyed expression. The more surprising part for me was it didn't just happen at one bridal gallery, but a few had the same attitude towards us. To make it all worse, the moment we revealed that we were actually just looking for wedding gowns to rent, and not get an entire photography package, they get pretty upset and wouldn't really want to serve us anymore. Many times I would be told to just browse the gowns myself, out of the 101 racks that they had. Perhaps this is because they don't really get a lot of commission from just making gown rentals transactions alone. So yeah most of the time I would just be browsing racks after racks myself, and finally after picking a few gowns I would need to ask the staff to help me get changed into them. The whole experience was nothing close to what I had envisioned. Not at all. You can say that I was pretty disappointed. Boon and I got married at 27 and 23 respectively. He had just started working not too long ago while yours truly was fresh out of uni 😅 We didn't have a big wedding budget cos in the same year Boon bought a house and renovations were ongoing, so renting a gown was the only way to go. In the end I got my gown rented from Pretty in White which looked close enough to what I had envisioned. After the whole ordeal of gown-hunting (which turned out to be much more difficult and unpleasant than I had imagined), I had many questions in my mind. "Why is it so difficult to look for classy, simple designs?" Most of the gowns in bridal galleries I visited were too over-the-top for me, and if I found a gown that was close enough to what I wanted, it'll be too long. And length alterations aren't possible for gown rentals. "Why are the people in the wedding industry so unhappy?" And I just felt really sad about it because we only get married once in our lives (or at least that's what we hope to achieve), and wedding prep is already stressful enough when it comes to finances and dealing with guests and families' expectations. So why should a gown searching experience add to the stress of the couple? Why should liaising with different vendors be an unpleasant experience? I just felt sad that such a happy industry was filled with people who were driven by money, and not passion. Most bridal galleries are only occupied about getting sign-ups for photography packages. Not that photography packages are a bad thing, don't get me wrong. It's just sad that that's all they care about, because photography packages are where the big money is. It all got me thinking and I felt strongly that there should be a change in our local wedding industry. There's obviously a lot to improve on, and somewhere in my heart I knew I wanted to do something with weddings sooner or later. And I just left it at that, got married, went for our honeymoon, came back to reality and continued with life as a new wife and working on Chiq Fliq. Life got busy and this dream of mine got pushed further and further to the back of my head. As much as I deliberately chose not to think too much about it, this dream of mine has been growing in my heart without me realizing. Each time I came across a wedding gown on Instagram or Pinterest, I would get super excited about it. I would start to study it and think of how I can modify it to suit my style, to suit different figures of us Asian women. And then I'll be like, "Why am I even thinking about this again?" Each time I came across cliché motivational quotes about "Pursuing your dreams", this dream of mine will resurface again. 2015 was the year of many changes. I got pregnant in March, and decided with a heavy heart to put a close to Chiq Fliq to focus on the baby. That was what I told everybody, even myself. But deep down in my heart I was hoping that with the end of Chiq Fliq, new doors might open. Because I knew that as long as I was still doing CF, this dream of mine will never have a chance to be realized. But I was too scared, and too uncertain to admit it. I told myself that with pregnancy being difficult at that time, I should really focus on getting the baby out healthily and safely, and continue with blogging and social media on the side. I convinced myself that I should be a stay-at-home-mom, and the fact that I could still earn side income from blogging and social media while being a SAHM was very good already. I shouldn't mess up the wonderful life arrangements that I already had and get myself all stressed up with starting a business. So I continued ignoring the occasional resurfacing of dreams, and continually shut them down. "I Am Not Done With You"
In July 2015, we went for a babymoon in Sydney which was when Hillsong Conference was happening at the same time. We decided to go for one of their night sessions which were open to public. I was excited cos having attended the one in the year before, I knew their night sessions were reserved for the best speakers in the conference. Little did I know that it was going to be one of the most life-changing nights of my life. The speaker of the night session was Jentezen Franklin, and he started his message by asking all of us in the huge All Phones Arena stadium to listen closely to something that he was going to play in a few seconds. Within the next 30 seconds, I heard a soft, high pitch frequency sound but wasn't sure if that was what he was talking about. He later on asked us if any of us heard that same sound, and to my surprise, only 20-30% of the people raised their hands. He asked us to look around us, if we saw any similarity among us who raised our hands. He then revealed that this high frequency sound that was played was only able to be heard by those who were below the age of 30. Then he dived straight into his message that says there are things that we can only hear from God while we're young. The older you get, the harder it is for you to hear from God because you get so caught up with life. So before you get jaded by the routines and stresses of life, hear from him and do what he says you should do. Throughout the message, the one thing that impacted me the most was the realization that "I am still young". I was 26, pregnant, and all set for life as a mom. In my human mind, I thought this was it. I'm all set, this will be my life right now. And I was honestly okay. I wanted to have a baby and start a family so badly, I love children, and I love the idea of staying at home and bringing them up by myself. I could totally live with that. But God had bigger plans for me. Throughout the whole night while I was listening to the message, I kept hearing God impressing upon my heart, tugging at it and telling me, "My daughter, I am not done with you yet." After escaping from this dream and shutting it down time after time, and after planning and setting out my life to be a SAHM, He's asking me to think bigger, dream bigger and do more with my life. "I gave you dreams, talents and gifts for a reason. Use them." After that night, I had a discussion with Boon who has always been encouraging me to pursue my dreams and interests. And this time it was no different. I told him my concerns, what if I become too busy for our baby? Where are we gonna find the money to start this business? Where am I going to find my suppliers? It's all so new, so foreign. There would be so many challenges ahead because not only will this affect the both of us, it'll affect how our family functions in the near future. It'll determine if I were going to be a stay-at-home-mom or a full-time-working-mom in the near future. It's a decision that changes everything. He asked me to pray about it, sit on it for a bit more before making a decision, and study the industry and business model while at it. And that was what I did. All throughout my second and third trimester, apart from reading articles from Baby Center and shopping online for Tyler (who was called beanbean back in the womb), I was reading up articles upon articles about the wedding industry, how the big brands started, and what it all entails. Months later, Tyler was born and the first 3 months were crazy as it is for most first-time mothers. Confinement, healing of my c-sec incision, struggles of breastfeeding, colicky baby, sleepless nights, etc.. After the first 3 month of madness, things were getting easier and more under control, and that was when I started looking into things again, which was something I was so looking forward to. In those months I tested a few suppliers that really disappointed me with their work quality, explored partnerships that didn't work out, and was close to letting this dream go. Yet time after time God was still tugging at my heart to keep on going for it. So I told Him in my prayer one day, and said "God, I really need you to come through for me. I tried everything. I exhausted all my human knowledge and resources. If you want me to do this, you gotta make this happen for me. You take over from here." This whole time I was trying to make this work in silence, because I wasn't sure if I were really going to do it. If I gave up halfway, at least it's just me and Boon who knows about it, so it'll be less humiliating. Nobody really knew about this dream and plan of mine, so I thought I could afford to back out anytime. But one day I felt I had enough of being fickle. I wanted myself to be serious about it, and I wanted God to perform a miracle for me. So I decided to take a leap. In June 2016, I searched "online survey maker" on Google and started to create my marketing research survey, and sent them out to almost every female friends I had who were single, attached, engaged and married. In a matter of days I gathered 300+ results that helped me understand my market better. Now I committed myself to 300+ of my friends and acquaintances, so there's no way for me to escape anymore. I really had to commit to this. I've always heard from speakers in church that "When you take one step towards God, He'll take a thousand steps towards you." But that hasn't really been very real to me before though I believed it wholeheartedly. Nothing really major happened to me that convinced me about that statement until one day, when I texted the online survey link to one of my acquaintances, who connected me to a supplier that I wouldn't otherwise have a way of being connected to. This supplier is everything I prayed for, needed and dreamed about, but was no where to be discovered and no way to be reached by my own capabilities even if I tried...until God performed a divine connection. I know I'm using big words here but trust me, there are no better words to describe this. If I hadn't taken that leap of faith, to take the first step and send out those online surveys, I wouldn't be able to move forward and get to this stage of my business. The journey of getting this business up has been long and winding. It's been a test of conviction, perseverance, patience and faith on many levels. For the first time on this blog, I'm very excited, scared, happy, nerve-wrecked to introduce my new baby to all of you. 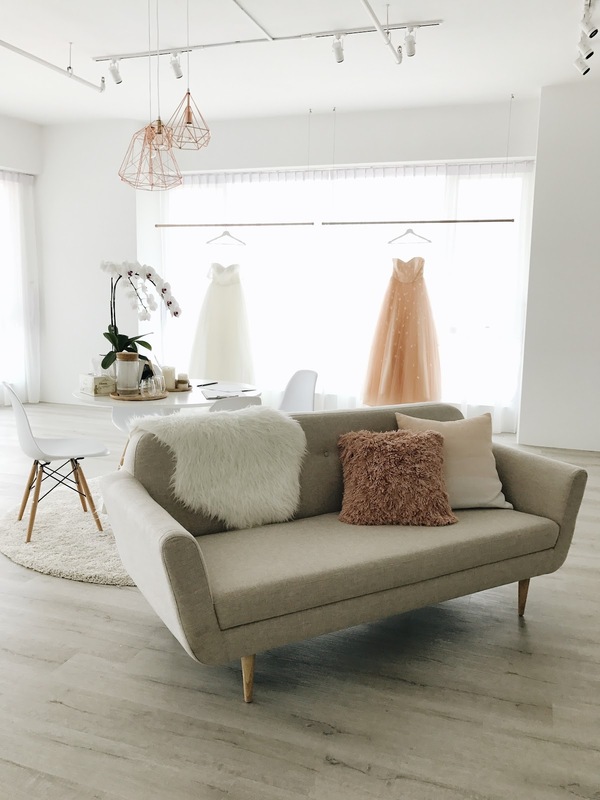 As most of you would have been able to guess (or even know from Instagram) by now, The White Atelier is a bridal gown boutique that offers customization and rental services for bridal gowns, evening gowns, cheongsam, bridesmaid dresses, veil, etc. The fact that I'm even sharing this photo with you guys brings tears to my eyes. It's been such a long journey. Most of you are probably wondering, but are too polite to ask this question! Remember I mentioned earlier in this post that I wanted to bring some form of change into the local wedding industry, and that there are still lots of room for improvement? #1: All our gowns are locally made. One of the biggest factors as to why it took me so long to get the business up was due to the fact that I couldn't settle with a trustworthy enough supplier. As much as marketing is important, nothing is more important than the product itself. And in the case of bridal gowns, they're too important to be taken lightly. I tried making a few test gowns from China but they just didn't meet my expectations. They may give me the fabric that I ask for, but the lower, cheaper version of the fabric. There were just too much risks involved if I were to send my designs to be made in China, especially custom-made orders from my clients. They would in no way be held responsible if the gowns did not turn out the way I designed, and if the gowns were damaged during shipping and handling. The last thing I want is to sell a gown that I'm not proud of to my client...for her WEDDING! Most bridal galleries source their gowns from China, and most of the time, you can tell that they're from China. Not that there's anything wrong with it, but what I want to do is to offer gowns made of different quality to our brides. Everyone knows where to source for China made gowns these days, and even if you don't set foot into China, you can also easily get hold of their gowns online, such as from Taobao. Anyone can open a bridal boutique simply by sourcing gowns from China. Just purchase them off the rack, rent a place and start renting the gowns to brides-to-be! Simple. Which was exactly what I didn't want to do, because I don't want to be known as just another bridal gallery. I must admit, when the going gets tough, it's pretty tempting to take the easy way out. But I'm glad I didn't just settle. And now I can be truly proud of what I'm doing. One thing that I chose not to compromise on is the quality of my products, even if it means making less profit from them. Because I believe that every product speaks for the brand itself. But sadly, that's not what a lot of bridal galleries think and do. A lot of them are out to get your one-time business, and are not bothered if you give a bad review because they know you are not a return customer, and are only going to get married once. Little do they know that like most businesses, if not more, the wedding industry is all based on trust. I'll likely spend a little more on a vendor that my friends speak positively about than go for another vendor that I've not heard of. Once the trust is broken, it's hard to gain it back especially when there are no second chances when it comes to weddings. So yes, all our gowns are made by our team of seasoned home-based seamstresses, hand sewn locally right here in Malaysia. The same goes for gowns that are up for rental, they're all made locally specially to be made available for rent or purchase. You can also be sure that they weren't made in sweatshops by underpaid and ill-treated workers. Which leads me to the next one! #2: Every piece of gown is designed in-house, by yours truly. In case you're wondering, no I didn't come from a fashion design background (but a mass comm background 😂). I can only sew real basic stuff though I have plans to learn and be better at it, which was why I got the experts to do what they do best instead of trying hard myself hahaha! Having said that, I believe that everyone can design and create something. You don't need to graduate from art school to be able to paint something beautiful, or go to carpentry school before you can build a chair. So yes, every gown is designed by yours truly, and before sending them for production, I'll go back and forth with my team to discuss the details, fabrics, placement of laces, etc before confirming the design. We will then proceed to sourcing the particular materials and fabrics before producing the gowns. The gowns that we design are largely influenced by my personal style preferences, so instead of designs that are very avant garde or complex, mine are mostly leaning towards timeless, classic designs with an ethereal flair. I envision my brides to look effortless on their wedding day, in silhouettes that flatter figures of the Asian women, nothing overly heavy or complicated that drowns them out. I believe that the gown shouldn't be the star of the day, but the bride herself. #3: All Viewings and Fittings are By Appointment Only. I thought about this for a long time before making a decision to arrange our sessions by appointment only. On one hand, if we allow walk-ins, we will definitely have a chance of brides making a decision on the spot to rent or custom make their gowns with us. I asked Boon and he thought allowing walk-ins will be a great idea cos we don't cut away this group of potential customers. It does make sense, but my heart just didn't feel comfortable with that idea. Because as a bride before, I understood that bridal gown hunting isn't like window shopping. It's more than just finding the right gown, it is an experience. Brides want to feel special and that cannot happen if I have 5 brides in my showroom all at the same time. What I want is for every bride who walks into my showroom to have undivided attention from me or my future assistants. I wish to spend time going through the details of what they have in mind for their wedding, take the time to explore gown designs or make sure that our brides find the right dress for rent or purchase off our racks. Every appointment will have at least one and a half hours in duration before the next appointment is scheduled, to leave enough room for chats and discussions to take place. My idea for our showroom is somewhere that brides can feel comfortable and at home when we meet, a place that is intimate and cozy, which is why I decided to go for a smaller showroom unit as opposed to going straight for a two-storey shop lot. For location, we wanted it to be accessible enough for the people in PJ, Subang and even KL. I wanted somewhere that has security cos I'll be working solo most of the time for now, and there'll be girls walking in and out of my showroom so it has to be somewhere safe. I also wanted somewhere with ample parking and not having to double park or pay a crazy amount. So we decided to go with Sunway Nexis offices in Kota Damansara, which is just walking distance from Sunway Giza, and connected to the new MRT which will be up and running real soon! There's a security on the ground floor who'll help our brides access our floor, and for parking, it has two floors and the best part is, it is free parking for the first 2 hours! Even subsequently it's only like, RM1/hour. On the ground floor of Sunway Nexis, there are lots of cafes and restaurants that the guys can hang at while their fiancées go for appointments (for brides who don't want their men to see their gowns until the big day!). One of the cafes that you'll probably know is the beautiful Rimba & Rusa which is just right opposite the elevator to access offices! So this place is perfect for what we want for now. Of course we have plans to one day operate at a bigger place, but for now we wanna start small to minimize as much startup cost as possible, so that we can offer our brides rates that are as reasonable as we can afford to. Now that I've shared a little bit about ourselves and what we do, let me now share with you some of the challenges we faced on this journey. Looking at our pictures on Instagram now, it's easy to think that it all happened in a breeze with little to no challenges along the way. But trust me, that's far from the truth. Let's start with what most start-ups struggle with. When this business was at its preliminary stage before anything even started, I was more concerned about getting the right suppliers than funding. Being surrounded with many entrepreneur friends, it seemed like getting funding wasn't that difficult since start-ups were sprouting like mushrooms all around us. So yeah I was pretty confident that we'd get the funding we needed somehow. To make things more complicated, I was at a stage where I didn't know which one should come first- should I get a trustworthy supplier first? Or secure funding first? Securing funding takes time, but if we didn't have a trustworthy supplier, even with the funding on hand, the business is a no-go. But the same is true if we have a trustworthy supplier, but no funding. The business ain't moving forward either. So it was a pretty chicken and egg situation which honestly made me pretty stressed out, cos both of which were waiting and depending on each other, and everything was just so uncertain. If you must know, one thing that kills me more than anything is uncertainty. I function very, very poorly and ineffectively when I'm not confident about what I'm doing. So being in that uncertain period really stressed me out. But of course securing the right supplier was my top priority cos without it, there won't be any business plan anyway. And no business plan, no funding. So right after we managed to secure our supplier, we dived right into looking at funding. We explored every possible way. We started by looking for grants, but sadly most of them are reserved for tech start-ups or green technology related businesses, and not retail. Then we looked into business loans, but times are bad so banks were very careful about releasing business loans, and even if they did, they'd be looking at businesses that have been operating for 3 years minimum. That was when I was getting a little discouraged cos, if you know me you'd know I hate to trouble others. If possible, I'd wanna do everything myself without having to ask others for help at all. But it seemed like in this case, we have exhausted some of our options and left with looking for investors or possible friendly loan from friends or family. Friends and family were my last options, so I went around asking anyone I knew who might know someone who's interested in investing or giving out a friendly loan. I was even open to paying a bank interest rate to whoever that was willing to loan us an amount. In those months of just waiting and asking around, there were a few people who seemed interested, but would go missing in action when it's time to discuss the real deal. It was a discouraging and frustrating period to say the least. A lot of waiting and waiting, and more waiting. We spent months in this cycle. After a while I decided to move on to the next option, which was my last option of asking friends and family if they would be interested in the friendly loan I mentioned earlier. Contacted a few friends and family members who might be keen, but everyone had their personal reasons for not getting involved. Which I was honestly okay, because I knew very well that nobody owed me anything. This dream is my own and they are in no way obligated to help me at all. I was still glad that I asked anyway, because I can at least say that I tried every possible way. That was when I told Boon that perhaps, this was not what God wanted us to do. Because if it were, He would certainly open a way. But it seemed like we were stuck in that phase for so long, and perhaps for a reason. Boon asked me not to give up just yet, and let him look into personal loans and explore further. Personal loans? That never crossed my mind at all. From my understanding personal loans were risky and not worth taking due to their high interest rates. But since that seemed to be the last possible option at that point, we decided to just look further into it. Most commercial banks offer at least 6% and up, which was pretty crazy. Then Boon looked further into it and found a few banks that offered pretty good rates, even better than business loans offered by the banks! Which was truly unexpected, and this surprised almost everybody we shared with too. So that was settled, we thought! From what we knew, it takes no more than a week to have the loan amount in. But since they needed to verify a few details about Boon's company, etc..it took them about 2 months to verify everything. So there goes more waiting in between. No funds in, no way of moving forward. After two months of waiting, we finally got the amount in our bank! Hallelujah!! It felt surreal to say the least. In the process of waiting, we scouted around for a studio location. We wanted some place small and cozy for a start to minimise our startup capital, so we looked at various places such as Oasis Square, Mitraland, Cascades and Sunway Nexis, and liked the latter the most. We held on to the lot that we loved and told our agent to give us just a bit more time- another two weeks, and another two, as we were still waiting for the loan amount to be in (which we had no idea when but only to hope it'll be soon). After a month or so of holding on to the unit, we finally got the loan amount in and were all ready to sign the agreement and pay the deposits. We met up with the agent and landlord, agreed on the rental amount and whatnot, and proceeded to sign the agreement on our end. We thought that yes, finally, things are starting to truly move forward! We breathed a sigh of relief and waited for the keys to be handed to us. We waited and waited, and our agent finally told us that the landlord had decided to rent the unit to another tenant who was willing to pay 50% more than our agreed monthly rental. He said it's either we match the new rental offer, or we drop the agreement. Then we found out that the landlord hadn't signed the agreement even after two weeks. We called him up to find out further, to which he said our agent delayed and delayed and he'd been waiting for the agent to pass him the agreement to sign. While on the other hand, the agent said he's passed the agreement to the landlord a long time ago but he refused to sign. We didn't know who was speaking the truth, but whatever it was, we decided not to go ahead with both the agent and landlord cos they were just unreliable. So with a heavy heart we decided to just forgo the place, get back our deposits and move on. .....there's a new problem now. We paid a few thousands in deposit, part of the amount supposedly for the agent, and the remaining were advanced rentals as deposits. The advanced rentals were already returned to us by the landlord almost immediately. As for the remaining amount supposedly paid to the agent, the agent refused to return the amount cos he said this breach of agreement was performed by the landlord and had nothing to do with him. So he wouldn't fork out that amount. On the other hand, the landlord said he hadn't signed any agreement yet so he's not supposed to pay us anything more than the deposits. So there we were...two of us...stuck in the middle of the agent and the landlord. All we wanted was to get our money back and move on, but the whole debate and blame-shifting took place for almost 2-3 weeks, none of them wanting to back down and pay up. In the end, after some threats from the landlord (dramatic isn't it? ), the agent said alright, he will fork out his personal savings to pay us back. Hahahaha seriously. Whatever it was, we were just glad to get our money back and move on from there. Then we found this new agent called Mikasa who handled many parts of Sunway Nexis. Ever since she took over, things have been going smoothly and uphill from there. She was helpful in expediting the process of getting the owners to agree, sign and pass us the keys. The search of the new place until we got the keys all happened pretty quickly. We thought yes, finally! Finally. We got the keys, got several contractors in to have a look at our unit and waited for their quotations. Settled with Mr. Yap who offered a reasonable rate and seemed very easy and comfortable to work with. Went to the management office to get the forms for renovation, and Mr Yap liaised with them from there onwards. Things were REALLY starting to move now, we thought! Yes!! Finally!! ...we got news that the landlord of the unit hadn't been paying up his management fees for a long time. So because of that, they're not approving our renovation until he pays up. We've come to a point of really asking, "Okay seriously, what's next?" From being frustrated, we learned to laugh at our circumstances and really just take it as a joke. I mean, seriously?? 😂 It's funny now but it wasn't really funny back then hahaha. That got settled after a while, and renovation started. Finally. In between renovation process, there were of course things that caused delays such as the unavailability of stocks for our vinyl flooring, etc..but they were nothing in comparison to whatever we experienced in the past few months really. Hahaha. When I say it's been a long journey, now you know I wasn't kidding. Delays after delays that tested our patience to the limits. But I'm glad we had each other throughout this season. I really can't imagine doing this alone all by myself. Boon helped me so much in securing funding and liaising with our agent for the location, and our contractor for the renovation, all while facing his own challenges in his workplace. It was a stressful period for him handling so many things (and headaches) at one go, yet he still held everything together so well. Really thankful for him. We ran on a very tight schedule that we only managed to get everything up one day before our first appointment with our brides-to-be. The very last day where we installed all our final fittings for the studio, have our huge mirror delivered, arranged all the furniture in place and hung the gowns up on our hanging racks, and finally looked like whatever I've imagined in my head all these while. Here are some pictures from the very beginning. Vinyl floor tiles to choose from! It was no question that 2908C was the one. When everything was still bare. Renovations took place for 2-3 weeks after Chinese New Year, and finally completed on 10th of March, 2017 (Friday). Spent the entire day in the studio ironing out the little details, and left around 9pm that night. I remember standing at the entrance of our studio and taking a good look at everything- the lights, air-conditioners, mirror, rugs, couch, table, gowns, curtains, and filled with so much emotions. I reflected back on the days when we were stressing out about funding and the rentals, and even way back when I first sent out the online surveys to my friends. We have come so far, and I was overwhelmed to say the least, filled with a mixture of feelings from joy, pride, excitement, relief, and awe. But most of all, I was washed over with a huge sense of gratefulness. It wasn't the smoothest nor easiest of journeys but I'm glad through it all, God was with us. And He made everything happen in His time. Through it all my faith has been stretched, trust in God deepened, and I can only anticipate what God can do for us way beyond what we can think or even imagine. This is only the beginning of a new chapter in our lives, and I pray that through The White Atelier, we can be a blessing to our clients in ways big and small, and through this business, we can create employment to the underprivileged. One day, we will make that happen- I want to be able to employ refugees, single moms, and those who struggle with living to equip them with the skills to sew and create. Stay in touch with The White Atelier through our website, Instagram and Facebook! That's all from me for now! Thank you for reading until the end. I know it's a reallyyyyy long one hahaha.